In 2004, a group of Soroptimists drove down from Chelmsford to London with a van full of shoes, which they would use to build a huge pyramid in Trafalgar Square. HI's Pyramid of Shoes was built to raise awareness about the victims of landmines and cluster bombs. Heather Knott was one of the Soroptimists taking part that day and ten years on she decided it was time to organise another Pyramid. 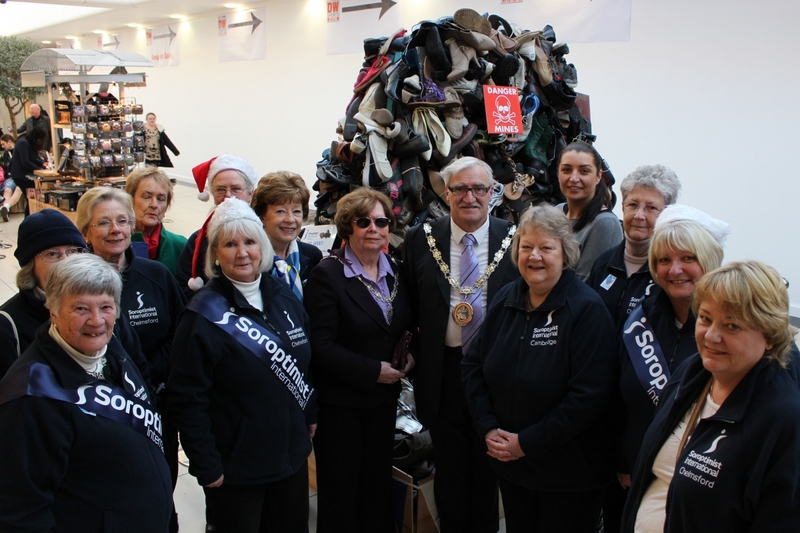 This time the Pyramid of Shoes would be in Chelmsford as part of the annual Forgotten 10 Challenge campaign. The event, which took place in December 2014, was a resounding success. We caught up with Heather to find out more. What prompted you to do another Pyramid of Shoes? It was ten years since we’d worked with HI on the Pyramid of Shoes in Trafalgar Square and I said it might be a nice idea to do it again. As I found out recently, in some countries, many of the deminers are women. And, worldwide, women and children make up more than half of the victims of landmines and cluster bombs. So it’s terribly important to educate people. There are too many people losing limbs and lives over this. How did you go about organising it? I am very fortunate that a friend of mine is manager of the High Chelmer shopping centre in Chelmsford. I contacted him and said we’d like to build a nice pyramid. I sent him an extract of HI’s guide to building a pyramid and he said, “Right, I’ll get my carpenters on to that.” It was brilliant. The shoes were piled so high, I could hardly see out of the car! As I did ten years ago, I contacted Soroptimist International clubs in our region and asked them to donate unwanted shoes. I collected the shoes at a regional meeting the week before the event. When I drove home afterwards, the shoes were piled so high I could hardly see out of the car! We stuck all the shoes on the pyramid framework. I wanted lots of shoes on there before we started. I didn’t want it to look like a miserable thing. We also arranged for a recycling company to collect the shoes afterwards. In 2005, seven-year-old Kanha from Cambodia became a victim of a war that finished before she was born. The little girl lost her leg in an accident with an unexploded bomb near her home. Soon after, she visited our rehabilitation centre and was fitted with her first prosthetic leg. Today, she still visits the centre to receive physiotherapy and to have her leg adjusted and replaced. Read more about Kanha, who was just seven when her life changed forever. We put adverts in the papers and went on local radio. We also put posters up in the shopping precinct saying bring your shoes on Saturday. On Saturday morning at 7.15am I was on BBC Essex radio saying ‘bring your shoes’. A lot of people who had heard the broadcast brought shoes along. I also paid £10 to put something about the pyramid on Facebook. It went to every female between 30 and 60 with a Facebook page in the Chelmsford area. It was accessed by 6,500 people. The Mayor and Mayoress of Chelmsford came down. We got lovely feedback from them. They wrote us a letter afterwards to say how happy they were to have attended and been part of it. Our Regional President and members from other clubs also came along. A lot of them had donated shoes, so they wanted to see what we had done with them! Our local MP, Simon Burns, is a personal friend of mine. He couldn’t be there because of a family event but wished us good luck. It was definitely worth it. It raised a lot of awareness and interest in both organisations (Soroptimist International and HI). Members of the public said the pyramid looked fantastic. Because HI had a petition, we were also able to approach passers-by and get lots of signatures. It was partly because of this that I was invited along to Number 10 when the petition was handed in. That was really good and a direct result of what we did on the day. The Pyramids are not the only way that Heather has lent her support to HI's campaigns over the years. She has organised numerous events to raise awareness about our work and during ten years as webmaster for the Soroptimist's UK Programme Action Committee, she regularly featured articles about our joint work to give a voice to the victims of explosive weapons. On behalf of HI’s team, and all the people like Kanha that we support, a big thank you to Heather and all the Soroptimist International members across the UK!